The moment you cross the border into the South of Scotland you’ll find yourself in a land of gently rolling hills, intimate river valleys and rugged coastlines and there’s no better way to discover the region than on horseback! Majestic scenery, stunning riding trails, friendly people and quality assured Horses Welcome B&Bs await riders wanting to get away from it all. Find yourself in horse heaven! The South of Scotland is right on your doorstep and is renowned for having some of the best horse riding country in Britain. Explore the South of Scotland Countryside Trails – a 350km network of way marked off-road routes in spectacular open hill ground. The old drove roads and Reivers routes in the Scottish Borders have a realistic and bloody history to offer and now you can follow in the footsteps and hoof prints of those who have gone before! The Tyne Esk Trails are set in glorious Midlothian countryside with sixty miles of horse riding trails comprising four circular routes. 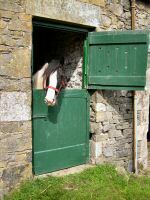 Dumfries & Galloway and South Lanarkshire offer the independent horse and rider beautiful riding routes and miles of rights of way for horses. The opportunities are limited only by your imagination!